Mission Statement Silver Linings Thrift Shop offers lightly used women's clothing, shoes and accessories; men's clothing; home decor & furniture; dishes & kitchenware; and books for sale at bargain prices. Proceeds from Silver Linings support Verde Valley Caregivers Coalition. Services and Projects Silver Linings Thrift Shop is located at 345 Jordan Road in uptown Sedona and is open from 11:00 a.m. to 3:00 p.m., Monday through Saturday. 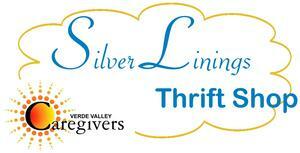 Support Verde Valley Caregivers Coalition by shopping at and donating to Silver Linings Thrift Shop.